SGI Dubai is a 20 year old established and proven business forum, which has generated billions of dollars of sales for exhibitors serving the signage (digital & conventional), printing, POP/POS and outdoor advertising industries. SGI Dubai tradeshow has many reasons as to why visitors and exhibitors should take part in this exhibition. Primarily one gets to meet the most important and eminent decision makers apart from networking with the key local and international industry professionals. There is scope for exploring the latest innovation and breakthroughs around the globe. One can get the chance to experience innovative developments first hand and also build and develop a strong customer base including future prospects to expand and propel ones' business. 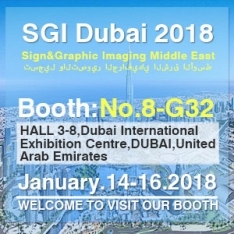 SGI Dubai, traditionally the first show in the graphic arts calendar of each year, will attract visitors not only from the MENA region but worldwide visiting the event whose reputation for excellent trade opportunities goes far beyond the region.